The cornea is a clear dome shaped structure in the front of the eye which helps focus what you see. Below are some corneal conditions that may lead to cloudiness or distortion of the cornea, which leads to loss of vision. - A corneal ulcer is usually caused by an infection of the cornea. A corneal ulcer can cause eye pain, redness, light sensitivity, and loss of vision. It may be associated with contact lens use. An infectious cornea ulcer requires treatment by an eye doctor. Treatment usually consists of antibiotic eye drops. A corneal ulcer may lead to a corneal scar. - A pterygium is a growth which starts over the white part of the eye in the conjunctiva and progressively grows across the cornea. A pterygium can become inflamed leading to eye irritation, discomfort, and redness. As it grows across the cornea, it can cause blurry vision by directly blocking your vision or by changing the shape of the cornea to induce astigmatism. Treatment for an inflamed pterygium includes anti-inflammatory eye drops. Advanced pterygium causing blurry vision may require surgical removal. - Keratoconus is a progressive thinning and distortion of the cornea. A normal cornea has a regular dome shaped structure which allows it to focus what we see. 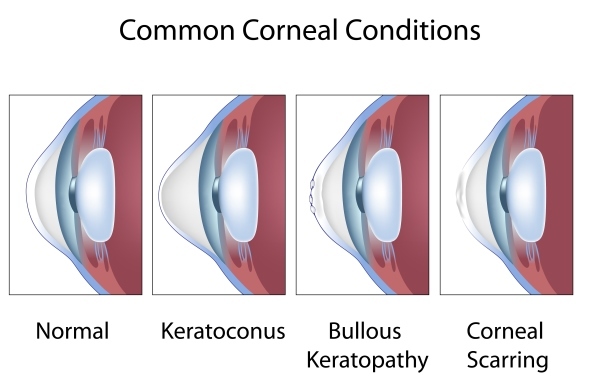 In keratoconus, the thinning of the cornea results in a cone shape which causes irregular astigmatism. This results in blurry vision. Advanced keratoconus can lead to scarring and a painful condition called hydrops. Vision in early and moderate keratoconus can usually be corrected with a hard contact lens. Surgical treatment for keratoconus includes insertion of plastic ring segments into the cornea to reduce the corneal distortion. More advanced keratoconus may require a Cornea Transplant to replace the distorted keratoconic cornea with a normal donor cornea. A new treatment called collagen cross-linking is currently being developed to strengthen the cornea and prevent progression of keratoconus. - Corneal dystrophy is a group of inherited eye disorders which can lead to loss of vision. Some corneal dystrophy can also cause eye pain, redness, and light sensitivity. Stromal cornea dystrophy causes opacification of the cornea which leads to loss of vision. Advanced corneal dystrophy may require a Cornea Transplant to replace the opacified cornea with a clear donor cornea. Another type of corneal dystrophy which leads to swelling of the cornea is called Fuchs’ corneal dystrophy. This can lead to eye pain and loss of vision. Early symptoms of corneal swelling may be alleviated by a hyperosmotic eye drop to reduce the swelling. More advanced cases of corneal swelling require DSEK surgery to replace the abnormal posterior part of the cornea with healthy donor tissue.